SAF-T-EZE® Pipe-Seal is compounded with PTFE to lubricate joint assembly. It is resistant to chemicals and can be used on pipes larger than 3/4" diameter to seal kerosene, LP gas, oil, water, weak caustic acids and low pressure steam. See Fine Pipe-Seal for pipes less than 3/4" diameter. SAF-T-EZE® Pipe-Seal will not run, drip or separate and will withstand moderately high pressure and performs to 500ºF (260ºC). When rubber is present Fine Pipe-Seal is recommended. Pipe-Seal with PTFE is used where resistance to chemicals is needed. It can be used on services that contain gasoline, kerosene, LP gases, oil, refrigerants / solvents, caustics, many acids, water, gas and steam. It can be used on pipes and threaded connections of all materials. Pipe-Seal is recommended for heavy duty sealing on joints larger than 3/4" in diameter. Pipe-Seal can be applied as low as 10ºF (-12ºC). Fine Pipe-Seal with PTFE is used where resistance to chemicals is needed. It can be used on services that contain gasoline, kerosene, LP gases, oil, refrigerants / solvents, caustics, many weak acids, water, gas and steam. It can be used on pipes and threaded connections of all materials: Iron, Stainless Steel, Aluminum, Brass, Plastic, etc. 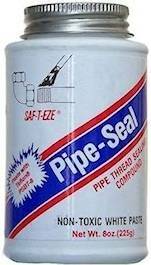 Fine Pipe-Seal is recommended for sealing of joints less than 3/4" in diameter. This liquid sealant is self-lubricating in assembly. This product will not swell or attack rubber parts.